Explore our collection of the finest three stone princess cut engagement rings. We balance exquisitely matched sparkling diamonds, styled within simple settings. From traditional designs to cutting-edge trilogy designs—we will create the perfect engagement ring for you—perfectly finished, delightfully packaged and backed by the reassurance of 60 days returns and a courtesy lifetime warranty. Bethany dazzles with a spectatular display of Princess-cut diamonds, from the trilogy setting down to the dazzling diamond set shoulders. Perfect for an engagement ring or even for that special anniversary present. Bethany comes in 4 carat weight options, choose from 0.50, 0.75, 1.00 and 1.25 carats with an additional 0.25cts down the shoulders. Graduated diamond sizes within the claw settings and 10 x 1.25mm diamonds within the channel set shoulders. 3 stone graduated princess cut diamond engagement ring featuring a graduated set of matched princess cut diamonds in an elegant claw setting. Exquisitely elegant 3 stone princess cut diamond engagement ring. Features a graduated set of matched princess cut diamonds in a number of different size options. Diamonds are claw set within an elegant, fine setting, above slim tapering solid shoulders. Timescale is typically around 3 weeks for this beautiful modern classic design. 3 equally sized princess cut diamonds, set within squared claws in this modern, and beautifully simple trilogy ring design. Elegantly styled. Equal diamond size. Claw set tapered shoulders. Court ring profile. Available in 18ct Yellow Gold, 18ct White Gold and 950 Platinum. Wood boxed, gift packaged. Three weeks delivery. Captivating trilliant and princess 3 stone diamond engagement ring featuring a uniquely styled setting with fancy shaped diamonds. Contemporary design. Elegant setting. Sweeping shoulders. Crossover detail. Court ring profile. Available in 18ct Yellow Gold, 18ct White Gold and 950 Platinum. Wood boxed, gift packaged. Approx. 3 weeks delivery. Beautiful three stone diamond engagement ring with box claws and set of Princess cut diamonds graduating in size, above a plain court profile band. 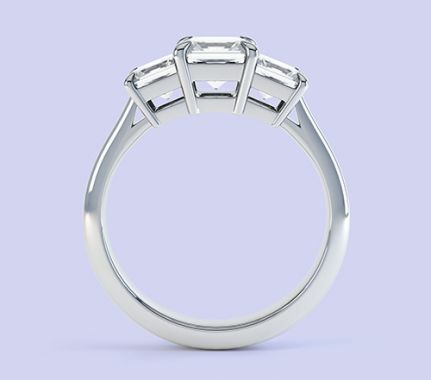 With uniquely styled square claws, this ring design is an alternative to R3D005 set with graduating sizes of square princess cut diamonds. 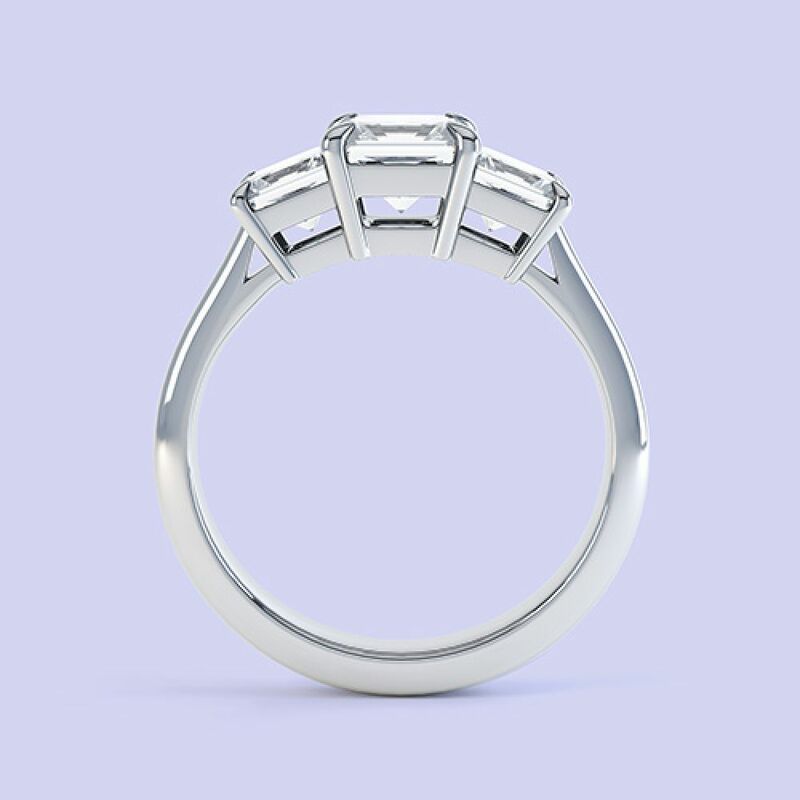 Each diamond corner is secured and protected by small right-angled square claws above a slender tapering shoulders. 3-4 weeks for completion. Wood boxed and gift packaged. Tension set princess cut diamond engagement ring precision set with 0.26 carats of princess cut diamonds with crossover shoulders. 3 stone princess cut diamond engagement ring featuring a set of perfectly matched, precision set princess cut diamonds. 0.26 carats total diamond weight. Fine, graceful slim crossover shoulders embrace either side of the setting. Please allow 4 weeks for this charming ring design. Beautifully boxed and gift packaged. Three stone princess engagement rings carry an altogether alternative look, compared to the more traditional round diamond styles. The geometric shape of the princess cut pairs beautifully with the squareness of a four claw setting. Our collection presents a delightful assortment of three stone princess rings—ranging from straight diamond sets with same sized diamonds, iconic favourites like the Trinity engagement ring featuring graduated diamonds above a slender band. We select the finest diamond cuts, grading and hand matching sets for precision and beauty. All items are sent fully insured with free shipping, Worldwide from the UK, to countries including USA, Canada, Ireland, Australia and Europe. Parcels arrive securely packaged and beautifully presented with a lifetime warranty and 60 days returns for your total reassurance.